Below are a range of our 3 day, 2 night Chiang Mai trekking tours. These are all private trips. Some are all walking and some include elephant riding and rafting. 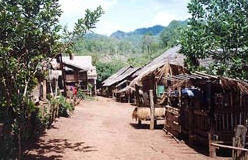 Accommodation is in hilltribe village houses. This way you get to see village life as it really is. If you have any questions or would like any further information about trekking please fill in our Trekking Enquiry Form . See all our Chiang Mai Trekking Itineraries. Difficulty = moderate Day 1 Drive out of Chiang Mai (approx 2 hrs.) , first stopping at the elephant camp for a 1hr elephant ride and some rafting. Drive on to a small rural town and stop for lunch. Walk in the afternoon for 3½ hrs. to a Lahu & Karen village. This takes you through farming areas and then the hills that lead to the areas inhabited by the hilltribes. We spend the night here, in a Karen house. Day 2 A total walking distance of 4½ hrs. ; we stop at a Shan village along the way for lunch. The area we walk through is at a higher altitude than the first day and passes through forested routes and hilltribe farming areas. Continue on in the afternoon, until we reach an Akha village, where we spend the night. 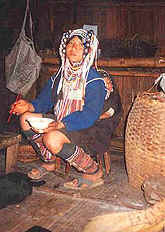 Learn about the fascinating Akha tribe and spend the night with the Akha host family. Highlights = elephant riding and rafting, as well as hiking through an unvisited area and meeting a variety of different hilltribes. Highlights = hiking through an unvisited area and meeting a variety of different hilltribes. 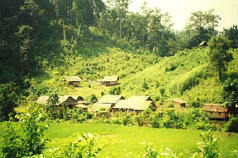 A chance to see the lifestyles of rural Thailand and be a guest for two nights in hilltribe homes. Day 1 Drive from Chiang Mai approx. 1hr and stop at the Elephant Camp. Enjoy elephant riding and rafting, approx. 1hr each. After lunch in a small town drive to the start of the trek. Walk for approx. 3hrs in the afternoon to a Karen village, where we spend the night. Day 2 Spend the day in and around this village. In the morning visit the farms and learn about the activities of the season. Later in the day go back to the village and learn about how rice is cooked and prepared according to traditional methods. Then you will get firsthand experience at how to prepare a delicious meal in a traditional kitchen - "hands on participation". Overnight in the village. Day 3 Trekking for 2hrs to visit a Palong village and stop for lunch. 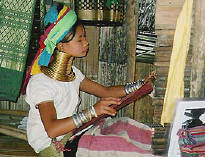 Learn about the fascinating Palong tribe. Then a 2hr walk downhill to Lisu and Akha villages. 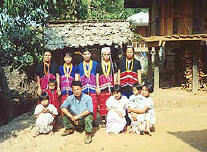 The Lisu tribe are one of the most colourful tribes of Northern Thailand. After a tour around the Lisu village, drive back to Chiang Mai (approx. 2hrs.). Highlights - elephant riding and rafting, visiting many kinds of hilltribes in a remote area, farm study and cookery lesson. Small group trip 14-16 June. We are looking for 2-6 people to join in this trek 14-16 June 2007. Day 3 Walk for approx. 2½hrs. to the Ping River and stop for lunch. Then board the bamboo rafts and cruise down the river for approx. 1½-2hrs. Then drive back to Chiang Mai (approx. 2hrs). Highlights - elephant riding and rafting, visiting the Karen and Palong tribes. Highlights - visiting Doi Inthanon National Park with its cooler climate and wonderful views; elephant riding and rafting, visiting the Karen tribe villages. Day 3 Walk for approx. 2½hrs. to the Ping River and stop for lunch. Then board the bamboo rafts and cruise down the river for approx. 1½-2hrs. Pick up from the rafting end point and drive approx 20mins to a Padong ("long neck") village. Short hike into the village and stay in the village to explore around and meet this tribe that came as refugees from Burma. Then drive back to Chiang Mai (approx. 2hrs). Highlights - elephant riding and rafting, visiting the Karen and Palong tribes. Visits the Padong "long neck" tribe on the third day. Chiang Mai Hotels - choose your accommodation in Chiang Mai. Choose from a wide range of hotels; from budget to luxury, from city centre to rustic resort, from shiny modern to traditional Lanna charm. Something to suit all tastes. Copyright © 1998-2008 Wayfarers Travel All rights reserved.